I know, it's another nail post so soon after another, but considering the spring/summer makeup launches have been out lately, combined with my love for all things labelled 'nail' and 'polish', it was kind of inevitable. After a couple of high end polish reviews, I thought it would be a good time to bring out the drugstore level ones, and obviously spring/summer launches always brings a new Essie collection for everyone to get excited about. I'm a little late to this year's seasonal launch is a mixture of brights, tanned colours, and one unusually dark shade which I found myself drawn to. 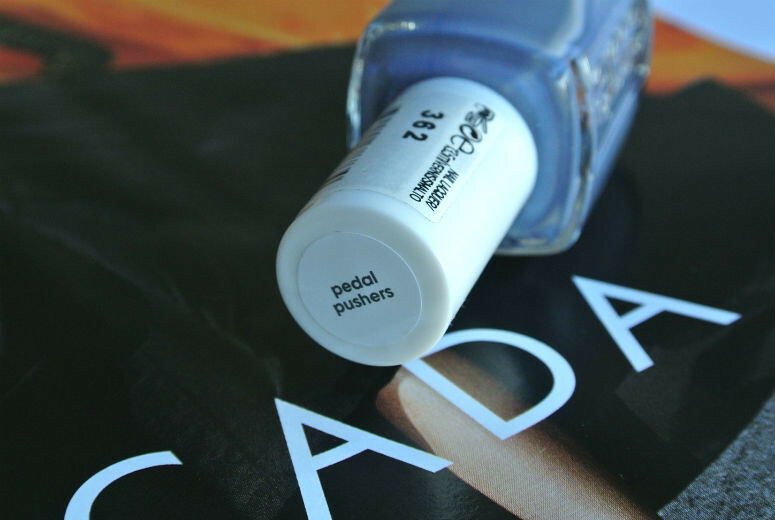 Petal Pushers (labelled 'Pedal Pushers' on mine for some reason) is described by Essie as a 'slate gray with red and blue undertones'. I think we can just say that it is purple/violet toned, which is what you would get if you mixed red and blue together. I personally find the colour a really flattering grey on my hands, and will look forward to wearing this all year round. The formula feels different to my older Essie polishes, it is a little thicker and even easier to get on. I only needed two coats to get a full look. If you're looking for a dark-ish grey that will probably match with all skintones, and looks very chic on, then I highly recommend this one.